Rare Chicken Rescue was the first of three shorts at the Monona Terrace on the Friday night of the Wisconsin Film Festival. It was ostensibly part of the "Farming and the Land on Film" series but was really a portrait of Mark Tully, who happens to breed rare chickens. Tully, you see, suffers from depression and at some point in the past that the movie never identifies, his life reached its nadir. 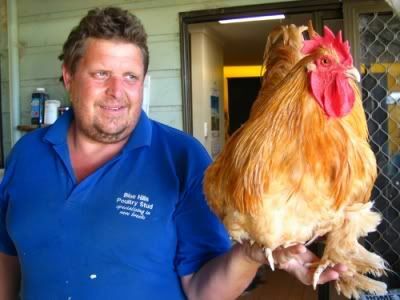 But the birds saved his life and now he dedicates it to seeking out rare breeds of chicken and raising them on his farm. Tully says that 69% of all breeds are on the verge of extinction and, with this in mind, he goes on a journey across his native Australia seeking the elusive Azeel and Sumatran. Rare varieties, we are told, grow more slowly and produce smaller eggs so they're essentially useless for commercial needs. Hence it is people like Tully and those he meets on his trek that keep rare poultry lines going. We meet Judy Hunt who also raises rare birds but she has no Azeels nor Sumatrans. Tully also takes us to a chicken show where breeders put their finest specimens on display and judges critique the animals on their shape, plumage, etc. Although our hero returns home empty-handed, audience members were well-rewarded with one of the best viewing experiences of the whole festival. Clocking in at a mere 26 minutes, it's easy to write Rare Chicken Rescue off as an alternately touching and funny profile of a fairly eccentric person. But this would be to miss what a masterwork the movie really is. While it certainly is touching and funny, the movie blends many elements together seamlessly & judiciously, and not a frame was wasted. I appreciated how Tully's depression was treated. His condition is not mentioned right away nor was not dwelt upon. Instead we get it in bursts. Tully will say that chickens have an almost unconditional love but the audience then is transported back to him driving his truck for a while before the topic of his depression is broached once again. With the emphasis not on his illness, the shot at the end of the movie with Tully holding an egg in his hand as a chick emerges seemed more poignant than it might have been had his depression taken center stage the whole time. 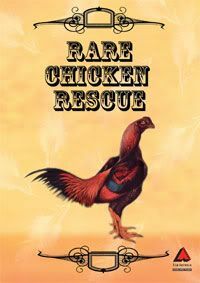 The makers of Rare Chicken Rescue also deserve kudos for their Errol Morris-lite approach which worked well. It was like a less arty Fast, Cheap & Out of Control. The interviewees generally looked directly at the camera, there was a reenactment (when the young Tully is given the box of chicks), and the slow motion shot of the albumen and yolk of a freshly cracked egg fall into a frying pan – all would have been right at home in one of Morris' films. But these techniques were not overused nor were any others such as the wide angle lens on the camera as it worked its way through a brood of chickens. Plus there were little touches which I appreciated such as how the camera did not follow subjects. They went offscreen but also came back into view. Another element I enjoyed was some of the contemplative idylls interspersed throughout. There were shots of Tully just staring off into the distance as he drove, for example. Rare Chicken Rescue was impeccably paced and a real breath of fresh air after having watched Handmade Nation in which someone had to be talking all the time and its occasional lapses into Blair Witch Project camerawork made me dizzy. Rare Chicken Rescue was, put simply, brilliant. I was entertained, witnessed a touching portrait of a man afflicted with depression, and learned about chickens to boot. It utilized a variety of techniques including animation, reenactments, and interviews and none them overstayed their welcome. Perhaps the best 26 minutes of my entire festival.